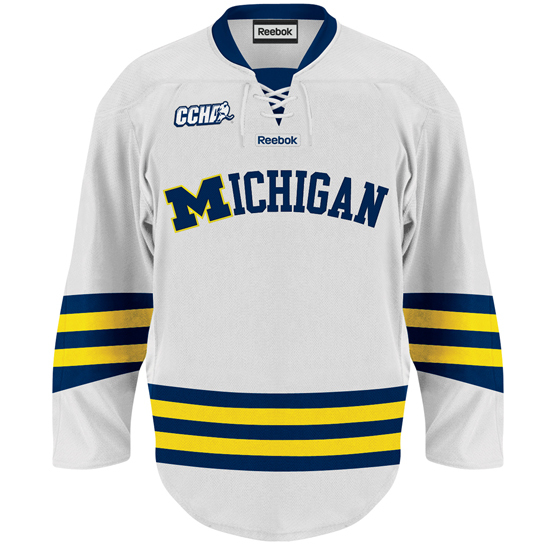 The Michigan Hockey twitter account linked out to pictures of the new jerseys today. The blue jersey is basically unchanged. We get a solid block M on the shoulder instead of the hockey-stick M. The M on the shoulders looks really nice. That's a solid looking jersey, even if I'm disappointed they didn't go for a blue version of the whites that they've worn the past few years. We're back to the maize jersey with a blue M, which, okay, it's nice to have that one every few years. The whites though? Ugh. After a couple of years with the modernized throwbacks, which I think are the nicest looking jerseys they've had since I've been following the team, they've tweaked them. It looks very similar except the M in "Michigan" is now a block M.
Un-fan. HSR points out that it could be somewhat based on a jersey from 1976 and that it's somewhat reminiscent of basketball jerseys past. I see it. And maybe I'm being somewhat inconsistent between my views on this jersey (ugh) and my views on the fairly-ugly football "throwbacks" for the Notre Dame game and the Big Chill jerseys (love both of them). I guess my philosophy is that ugly works for a throwback if it's a one-off. If it's the jersey the team is going to wear night-in and night-out, I'm less of a fan of ugly. The old whites were sweet because they were an old design modernized, but more than anything else, they looked sharp. The block M just makes it look kind of lopsided. I feel like something looks off about the arch. Not a fan. HSR has a post breaking down all three jerseys. I'll echo the sentiment. More than anything else, the change to the whites was unnecessary. The whites of the last couple years were classic. It feels like it loses something with the block M.
That said, Moffie and Spencer Hyman are fans. If not liking one of the three new jerseys is the biggest problem we've got, that's pretty good. ...especially given the new uncertainty in college hockey. So everyone knows by now that the Big Ten is only a couple of years away. Now it appears the breakup of the CCHA and WCHA will be right behind it. According to reports, Colorado College, North Dakota, Denver, Minnesota-Duluth, Nebraska-Omaha and Miami are set to break away and form a "super conference" of sorts. Western Michigan and Notre Dame have also been rumored, but are less uncertain. MGoBlog and MHNet have takes on the situation. Western College Hockey chimes in from a national perspective and CHN has a couple of good takes as well. Me? I'm just going to stick with what I've said all along, ever since talks of the BTHC started: I'm excited about more games on TV, more games on TV in HD, more exposure for the sport, more games against Minnesota and Wisconsin, and the possibility of re-opening college hockey to expansion due to the conferences having some open slots. But if it causes any of the smaller schools to fold their team, I don't like it at all. It also makes me kind of sad that the CCHA and WCHA entities are possibly going away. I felt the same way when it looked like the Big 12 was going to disband. With this, I still think we just have to wait and see. There's a lot of uncertainty and depending on scheduling agreements it might still work out. If BGSU still gets some games with the schools that draw well and play in a conference that's down Michigan/FYS/Miami/ND, maybe it's more realistic that they get back to the NCAAs someday. It's hard to not enjoy being a "have" and just think HDGAMESHDGAMESHDGAMESHDGAMESHDGAMES but anything that results in a former national champion folding isn't a good thing. They need to find a way to keep these programs around. If that happens, then I'm all for the Big 10 and whatever Super Conference they can come up with. Jeff Tambellini signed a deal to play in Zurich for the next three years. He's a third-generation player for the team, which is kind of cool, but man. I'm not joking about this: Out of all the players that have come through the Michigan program in the past decade, aside from JMFJ, there's not a player that I was more convinced was going to make it in the NHL. Maybe this will work out for him. He'll get a ton of ice time on a scoring line (instead of playing a 4th-line role that he's not really suited for) and according to the linked article, he'll actually likely be receiving a pay bump. He said that he had other opportunities in the NHL. Hopefully we'll see Tamby back here someday. His West Qua* roommate, *anny Richmon*, just signe* with the Washington Capitals. Andrew Ebbett signed with the Canucks and Jed Ortmeyer signed with the Minnesota Wild. Yes, all 3 of these styles are a step backward which the loss of the dazzlecloth material last year was also a huge blow to the look of the jerseys. The block M with the arch on the white is really bad and I loved the old arched MICHIGAN whites. I wish they would bring back the script dazzlecloth Maize from 2004-ish, those were sharp and give us a Wolverine shoulderpatch, great idea! We are disappointed. Is this a result of D.Brandon pushing his block M brand? Seems like if he listened to feedback from the blogs, facebook, or simply talking with fans, he'd figure out that it's unanimously hated. Hopefully he does and whoever designs them can come up with something better for 12-13. The trifecta! All three are worse (particularly the white one). We are on a roll. Not as bad as the "purple" dazzlesnazzy football jersey. Uck. I think this is a better jersey compared to previous ones. I love the purity of the color and the Printed Big M -ichigan. Keep rockin'. This design is fine compared to the purple jersey. By the way, the yellow and blue stripes look great.